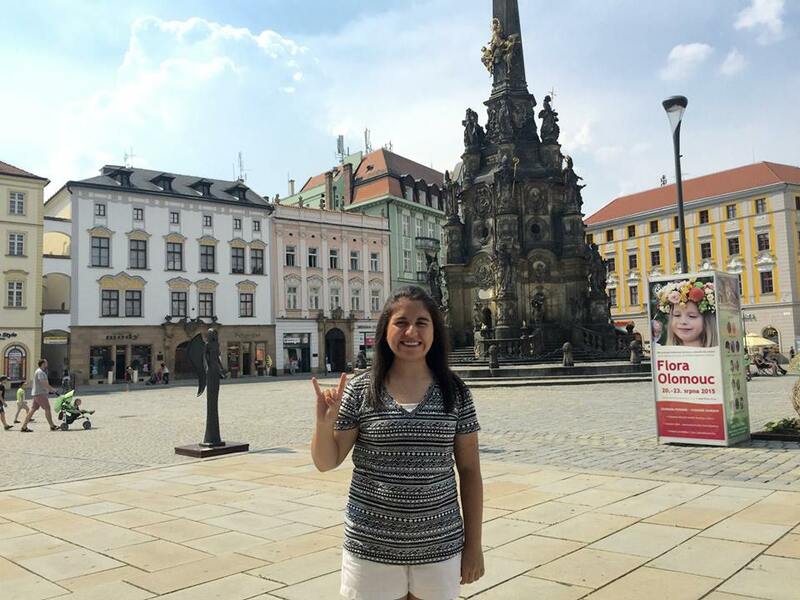 This summer, with the help of the Czech Studies Summer Fellowship at my university, The University of Texas at Austin, I studied abroad for one month at the Summer School of Slavonic Languages at Palacký University in Olomouc, Czech Republic. The program had 98 students from 30 countries, including 3 American students. The students ranged in ages from 14 to 77. Several cultural activities, film showings, and excursions were offered throughout the course of the program. I was able to take a beginner Russian language class while furthering my knowledge of the Czech language and culture. In the classroom, when not having a lesson, we learned traditional folk songs and tried Olomoucké tvarůžky, a favorite smelly cheese of the area. Banda representing UT at Horní náměstí — the largest square in the town of Olomouc, in eastern Czech Republic and historical capital city of Moravia. Olomouc is located in Moravia, the eastern region of the Czech Republic. Moravia is also where many of the Czechs who immigrated to Texas in the mid-1800s through early 1900s were from. During the weekends, I traveled to towns of origin of Texas Czechs, mainly those of Milam County families, since it was the Czech influence in Milam County that originally got me interested in Czech related studies. I visited the museum in Frenštát pod Radhoštěm, where there is an exhibit on Czech emigration to Texas. From Frenštát, I visited Tichá and Horní Sklenov, towns where the Marak family was from. The community of Marak, in Milam County, is named after that family. Due to its proximity to Horní Sklenov, I even managed a trip to Hukvaldy Castle in Hukvaldy, the hometown of Czech composer, Leoš Janáček. I also visited Vsetín and the surrounding towns of Jasenka, Janová, and Hovězí, where other Texas Czech families were from. My favorite part, however, was when I visited Žarošice. 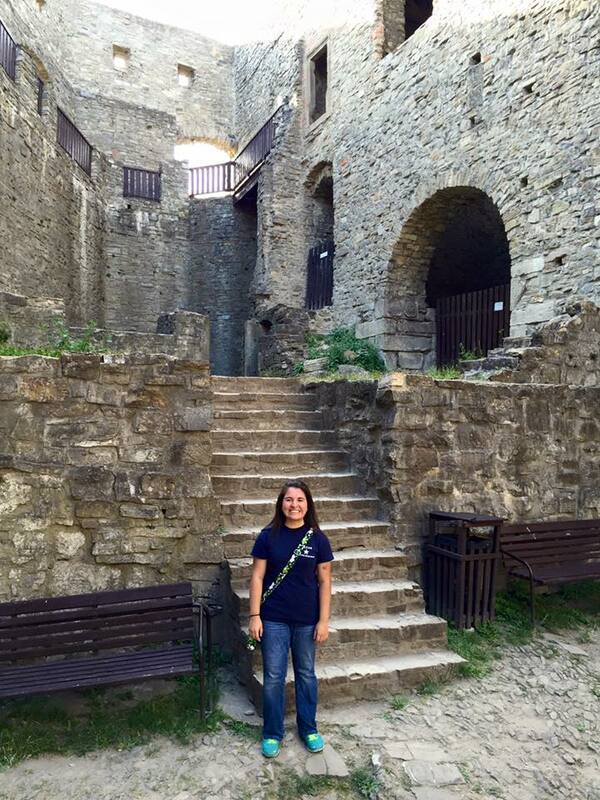 Celeste Banda at Hukvaldy Castle in its namesake village in the Czech Republic. I chose to visit Žarošice, a small town near Brno, because at least 7 Milam County families were from there. I stayed with the Hroudný family, who were very kind and generous, and toured the town and surrounding area. We visited the towns of Archlebov, Ždánice, and Slavkov u Brna, where at least another 5 Milam County families were from. Slavkov u Brna is also known as Austerlitz in German and is known for the Battle of Austerlitz, or the Battle of Three Emperors, which is considered one of Napoleon Bonaparte’s greatest victories. The Hroudný family took me to sites related to the battle. Within Žarošice is a marker showing where Ferdinand von Tiesenhausen died. Von Tiesenhausen was an assistant to Czar Alexander I and is said to be the inspiration for a character in Leo Tolstoy’s War and Peace. In Uhřice, we visited the mill where Napoleon met with Emperor Franz I of Austria after the battle. We also visited Žurán hill, where Napoleon’s army was headquartered, and Pracé hill, where there is a Cairn of Peace Memorial and Battle of Austerlitz museum. Before I left, Mr. Hroudný, who works at the Žarošice town museum, gave me several books useful for future research, some of which even mentioned my small hometown of Cameron, Texas! Banda in Žarošice, Czech Republic, a town about 135 miles from southeast of Prague (pop. 985). I greatly enjoyed furthering my knowledge of the Czech language, my adventures traveling to Texas Czech towns of origin, and even getting the chance to share my experiences with Texas Czech friends back home. Upon returning home, I visited with a 93 year old Milam County resident whose father was born in Moravia. He was so happy to be able to see photos and hear my stories about visiting the town where his father was born and grew up in. 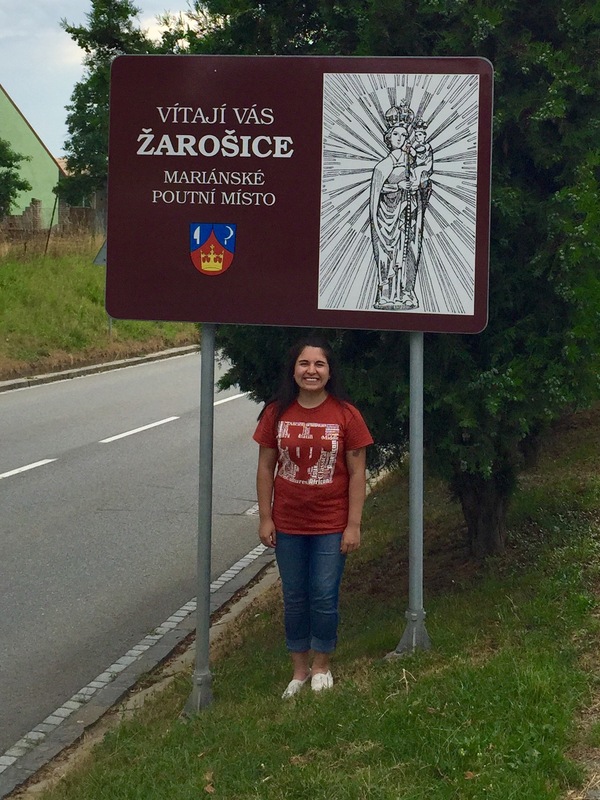 I greatly appreciate all of the experiences made possible with the help of the Czech Summer Scholarship.